With Six You Get Freedom! through the author’s second and final cast. A close-up of the cast-cutting blade. And nobody told me about the dead skin. 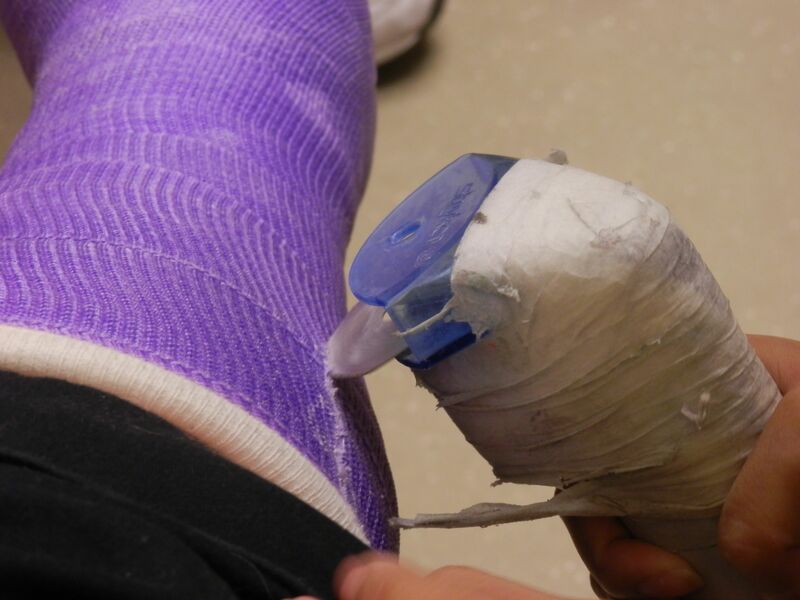 Just ask somebody who’s worn a cast for a long time about the skin under the cast. Even a horny 19-year-old wouldn’t want to touch that skin. As a broken-bone virgin, I had to Google “skin after cast removal” to find that … well, my flaky skin was typical. With scrubbing, however, baby skin does reappear. Incidentally, when I had the second cast and then had the ability to stand, I could stop washing myself in the sink. I could take a shower washing everything except the cast. To protect the cast, I used one of our tall kitchen garbage bags with the built-in ties. It fit perfectly over the cast, and kept my beautiful purple cast soak-free. Today, however, I am cast-less and can shower everything. I can also walk somewhat evenly and wear two shoes that match. I use a cane when I’m in public, mostly to fight off the men who are attracted to limping un-lean ladies post-menopause. Occasionally the cane also comes in handy to prevent wobbling. Every day seems better than the last, so I’m optimistic about my ankle’s future. The world has much more serious problems than mine. The Las Vegas Strip was shaded with smoke due to the Carpenter 1 wildfire. For example. Just outside of Las Vegas in the Spring Mountains, last week’s Carpenter 1 wildfire consumed almost 30,000 acres and even spread to remote sections of the Red Rock Canyon National Conservation Area. Mountain-dwellers were evacuated and Friday’s paper even talked about Indian rain dances to perhaps help bring in very welcome rain…and yes the rains came. 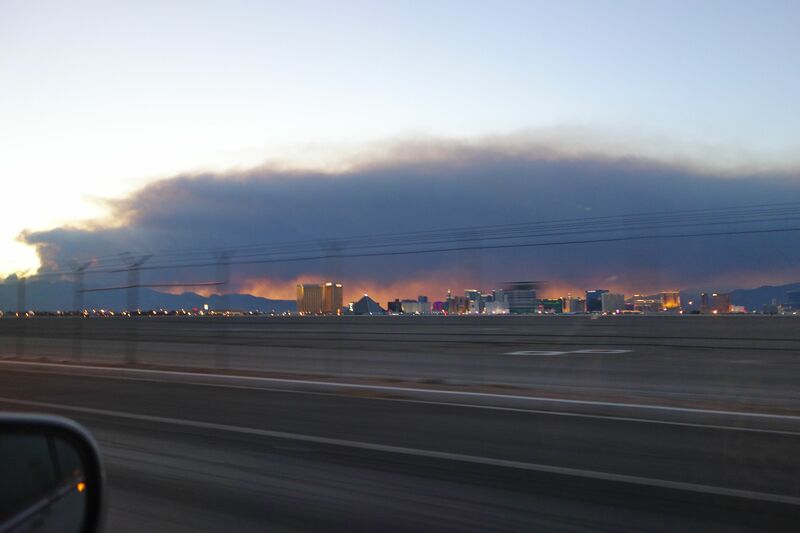 This is a picture I took last Monday of the smoke from the fire as seen from a road just south of McCarran International Airport. Las Vegas itself was not in danger from the fire. Here is a map that shows the fire location. 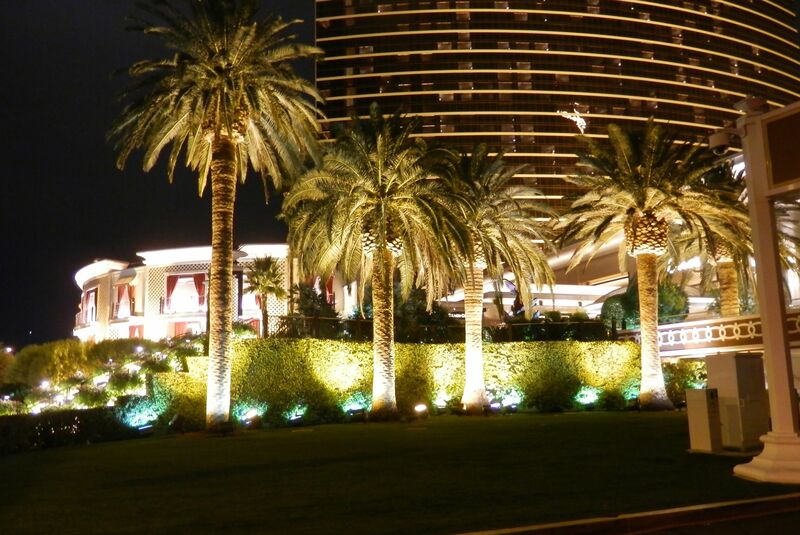 Exiting the Wynn Las Vegas parking lot, this is the view looking at Wynn’s Encore Resort. Ever since my broken ankle, I have avoided my weekly trip to The Wynn Las Vegas. My husband and I have been in the habit of visiting this beautiful casino once a week. I’ve gambled enough there to get $25 a week in play cash which my husband played for me the past six weeks. (I’m now down to $10 in play cash because my husband can’t bring himself to waste money playing slot machines.) Yesterday I went back to the Wynn and noted anew how lovely a place it is. The flowers and lighted trees at the entrance reminded me of Christmas in July. The lighted palm trees seen as we left the parking area were spectacular. Even the carpet at the bottom of the luggage carriers is beautiful. AND, I played two Buffalo machines at the Wynn for 90 minutes and won $23. I’m back! Last weekend I attended a concert at the Smith Center featuring pianist and conductor Vincent Falcone. 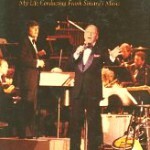 After the concert, Falcone signed a book for us, a book about his career playing for Frank Sinatra and other major stars. The book is some eight years old, but if you want to know about the passion of a musician, I recommend “Frankly Just Between Us” by Vincent Falcone and Bob Popyk. Falcone has had quite a life.